It is the sort of exhaustion that we see in Europeans' falling birth rates, the mushrooming public debt, chaos in the streets, and Europe's refusal to invest resources in its security and military might. Last month, in a Paris suburb, the Basilica of Saint Denis, where France's Christian kings are buried, was occupied by 80 migrants and pro-illegal-immigration activists. The police had to intervene to free the site. "Christianity as a default, as a norm, is gone, and probably gone for good - or at least for the next 100 years," Bullivant said. The European mainstream mindset now seems to believe that "evil" comes only from our own sins: racism, sexism, elitism, xenophobia, homophobia, the guilt of the heterosexual white Western male --and never from non-European cultures. So Europe now postulates an infinite idealization of the "other", above all the migrant. The heritage and legacy of Western civilization gets sectioned off piece by piece so that nothing remains; our values are mocked and our survival instinct is inhibited. It is a process of decomposition that Europe's political authorities seem to have decided to mediate, as if it were inevitable. The most powerful politician in Europe capitulated: she evidently forgot (again) the difference between the civil rights of individuals, which Muslim citizens enjoy in Germany, and the sources of a national identity, on which Europe is based: humanistic, Judeo-Christian values. This realization may why a week earlier the new German Interior minister, Horst Seehofer, said that "Germany has been shaped by Christianity" and not by Islam. Europe's tiredness can also be seen in a generational conflict embodied in the alarming rise of public debt. In Italy, the political establishment was recently shaken up by the election of two major populist parties. It is a country with a public debt of 40,000 euros per capita, and a tax burden equal to 43.3% of GDP. The average age of the population is the third oldest in the world, together with one of the lowest birthrates on the planet, one of the lowest retirement ages in Europe and the highest social security spending-to-GDP ratio in the Western world. It is also a country where pensions account for one-third of all public spending and where the percentage of pensioners in proportion to workers will rise from 37% today to 65% in 2040 (from three workers who support one pensioner to three workers who support two pensioners). An Islamist challenge to this tired and decaying society could be a decisive one. Only Europe's Christian population is barren and aging. The Muslim population is fertile and young. "In most European countries--including England, Germany, Italy and Russia, Christian deaths outnumbered Christian births from 2010 to 2015," writes the Wall Street Journal. Terrorist attacks will continue in Europe. Recently, in Trèbes, southern France, a jihadist took hostages in a supermarket and claimed allegiance to ISIS. It seems that Europe's societies consider themselves so strong and their ability to absorb mass immigration so extensive, that nothing will prevent them from believing they can assimilate and manage terrorist acts as they have automobile fatalities or natural disasters. A tiredness also seems to be why these countries do not take meaningful measures to defeat jihadism, such as closing Salafist mosques or expelling radical imams. Muslim extremists understand this advantage: so long as they avoid another enormous massacre like 9/11, they will be able to continue murdering people and undermining the West without awakening it from its inertia. 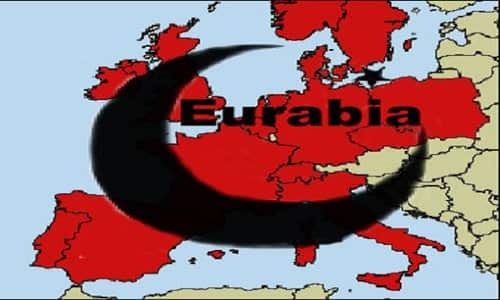 The most likely scenario is that everything will continue: the internal fracture of Europe, two parallel societies and the debasement of Western culture. Piece by piece, European society seems to be coming irreparably apart.